I am saddened to report that Starr Saphir died on February 5, 2013, at Calvary Hospice in New York after an eleven-year battle with breast cancer. 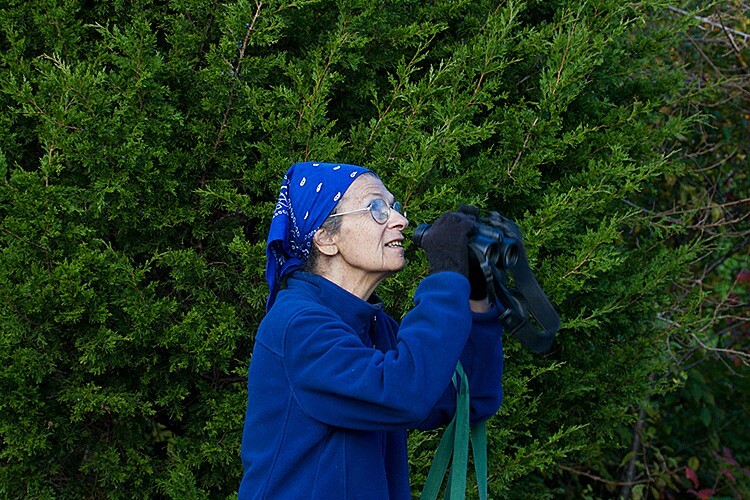 Her skills as a birder were legendary. For nearly forty years she gave birding walks in Central Park and around the world that were noted for their unusual sightings. She was a friend, teacher, mentor, and inspiration to many. Her daughters Shawna and Lara loved her very much. We are all going to miss her. I recently published a birding book in which Starr is featured, A Big Manhattan Year: Tales of Competitive Birding. See the book’s site for more details. Starr’s extraordinary life was accorded the recognition and rare honor of a New York Times obituary, written by Douglas Martin and published on Sunday, February 10th. The Times, a British newspaper, also published an obituary on February 16th. In lieu of flowers or other tributes, Starr wanted any donations to be made to the Cerulean Warbler Fund. This is run through the American Bird Conservancy and will serve to protect Cerulean Warbler habitats both in this country and in South America. To donate online, please go to abcbirds.org and click on the ‘donate now’ button. In the mail code box, please enter ‘Cerulean Warbler’ to be sure that your donation goes to the Cerulean Warbler Fund. American Bird Conservancy, P.O. Box 249, The Plains, VA 20198. Please see the beautiful tribute to her mother that Shawna Leigh wrote. NPR Blog has published this remembrance of Starr, and Margot Adler of NPR, who has attended Starr’s walks, has written this one. The HBO documentary mentioned, Birders: The Central Park Effect, of which Starr Saphir is the featured subject, will be rebroadcast frequently on various HBO channels. See the schedule. It is also available on HBO GO and HBO On Demand. The film is also available through the usual sources online (e.g., Amazon, iTunes, Netflix) as a download or DVD. Starr began birding in 1946 gave birding tours across the world for nearly 40 years. She kept written logs of all the birding she did since the day she began. She had 259 bird species in Central Park alone. She has compiled some extraordinary birding records locally, nationally, and overseas. Starr is the featured subject of the documentary “Birders: The Central Park Effect,” directed by Jeffrey Kimball, which debuted on HBO on 16 July 2012 at 9pm EDT. The film had its theatrical debut in Manhattan on January 18th, 2013, at Cinema Village. Watch the trailer for it, and see Mr. Kimball’s site for the film. The DVD or digital download is now available on Netflix, Amazon, iTunes, and other sources. The Wall Street Journal published this profile of Starr in advance of the film. Reviews of the film appeared in the NY Post, LA TImes, NY Daily News, Newsday, AM New York, and BirdWatchingDaily. A discussion of the making of the film focusing on Mr. Kimball (but also mentioning and quoting Starr) appeared in the New York Times. On Sunday, February 10th, 2013, the New York Times published this obituary of Starr, written by Douglas Martin. It is a well-researched piece that offers some biographical information about Starr not available elsewhere.